- tested in QEMU: 5D, 5D2, 5D3, 5D4, 6D, 6D2, 7D, 7D2, 40D, 50D, 60D, 70D, 77D, 80D, 400D, 450D, 500D, 550D, 600D, 650D, 700D, 750D, 760D, 800D, 100D, 200D, 1000D, 1100D, 1200D, 1300D, EOSM, EOSM2, M50, SX70. - other models from the same generation may work, too (see the FIR list for models not yet running ML). Lately I've got a few softbricked cameras to diagnose, and struggled a bit with the ROM dumper from bootloader: it wasn't quite reliable. A while ago, g3gg0 reimplemented it with low-level routines (which worked on his camera, but not on mine). Today I looked again at the old approach, and it looks like the file I/O routines from bootloader had to be called from RAM, not from ROM. So, I've updated the code and need some testing. I've emulated this in QEMU, but the results may be different on real hardware. - after it's finished, look on the card, and you will find 4 files: ROM.BIN and ROM.MD5. - repeat the test on the same card (let it overwrite the files), then on a card with different size (and maybe different filesystem). The ROM dumper should recognize all ML-enabled cameras, except for 5D2, 50D and 500D. These old models do not appear to have file writing routines in the bootloader (or, at least I could not find them). The QEMU simulation works even on exotic models like 1200D or EOS M2. So, you don't have to upload any files or screenshots. Simply verify the MD5 checksums on your PC (if in doubt, paste the md5sum output). That's it, thanks for testing. Both 100D.100B and 70D.111A get stuck at "Dumping ROM0...". No LED activity neither any sign of placing / writing files to sdcard on both cams. ... and doing nothing else. No LED activity, no file. 7D: Pretty much the same. Different strings for Model ID and ROMBASEADDR of course. 700D works and gives Files, But ROM1.MD5 checksum changes each time, ROM0.MD5 stays the same. I used winmd5free, I ran 1 test, got the checksum from ROM0.MD5 and copy and pasted it in the Original text box, then ran test again and loaded new ROM0.MD5 and checksum was same as first. Did same steps for ROM1.MD5, but checksum was differ. Did I even do it correctly or were you wanting something else? On 700D, ROM0 does not appear to be connected, so you are interested only in ROM1. Any 600D user can try it? Only can try with 1 card though, don't have any extra cards at this time. Made some updates. Can you try again on 600D, 650D and 700D? I don't expect it to work on 7D, but who knows. 7d hangs after line "- Dumping ROM 0. . .". 650D does simply fly through "-Dumping ROM 0. . .". Much too fast, about 20 seconds between ROM and MD5 line. Hangs after ROM 1 message. MD5 file seems to be corrupted. Windows wants to check the card, other files seems to be out of order, too. Boys, take warning about card corruption seriously! I can also confirm this as well for the 7D. I managed to get correct ROM dumps on 5D3 on an 8GB card that was previously failing (filesystem corruption). It's still not perfect, the first file saved ends up corrupted, but seems to be a small step forward. The issue: Canon's bootloader routines for file I/O copy the data to some cacheable (!) memory; when that buffer reaches 0x4000 bytes, it's written to card using DMA. However, patching Canon code to use an uncacheable memory pointer didn't help. Before, I was disabling data and instruction caches, and I could get correct dumps on an old 256MB (yes, MB) card. Still, the first file is always saved with incorrect checksum on the 8GB card. To work around this, I dump the two ROMs twice => 4 files. First has incorrect checksum, next 3 are fine, and the behavior is very consistent. All 4 files end up correct on the 256MB card. I've updated the autoexec.bin from the first post, and I'd like you to try it on all ML-enabled cameras, except 7D. Used a 1 GB card formatted with cam. Inserted into cam and - after a while - done. Anything else to test on 650D? Other card sizes, file systems? For Windows, cygwin might have the equivalent command, otherwise you may have to use a GUI. EDIT: BTW, is it intended to use lowercase for first bin and uppercase for the rest? Looks like it finally worked, right? The case difference is not intended. Maybe it has to do with the corruption I'm experiencing for the first file? canon released a bunch of firmware updates recently. Any plans on updating the portable dumper so it works for all cameras? Can you post a dumper for 7D1 please? +1 as this should open some doors for newer firmwares that were released by Canon recently. or maybe update the portable binary to save the 7D ROM? I don't have one ready; the portable codebase probably requires some sort of IPC communication. Understanding it could be useful for other things as well (QEMU, 7D2, running code on master without FIR). On 7D, I don't even know how to blink the LED from bootloader context (source), but can be found out from the dm-spy branch (binary search to find out where the LED starts to blink with the usual register commands, to see what Canon code does). If you have enough patience, g3gg0 committed some QR code experiments on the portable codebase. Might be useful. Used the portable dumper to get a 700D.115 ROM1.BIN. Would this be the first step to porting a firmware update? Notes: An exfat formatted card didn't work and neither did an old 8GB card but a fairly new 32GB SanDisk Extreme PRO worked--the second time I tried it. The first time it only saved the ROM0B.MD5 file. Interesting that the card was renamed to EOS_DEVELOP. Got my hands on a 7D and the first thing I tried was to get a dump of the latest 2.0.6 firmware just to see if some of the stubs that I'm not finding porting 2.0.3 to the crop_rec_4k branch. Yeah, that's a long shot. Of course I hit the wall with the Portable ROM dumper. I also tried the DUMP1300.FIR and dumperM2.fir, another long shot that didn't work. Is there any way to dump the 7D ROM? There must be but maybe the original porting notes are long forgotten? I couldn't dig up anything in previous forum posts. Just an interesting observation. 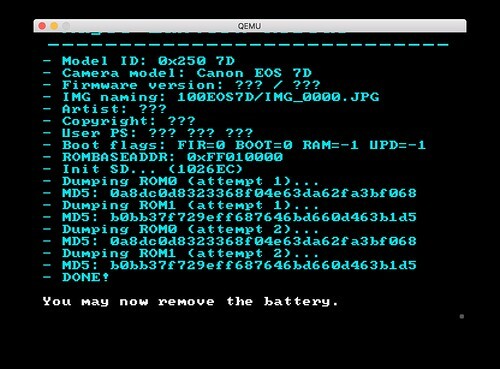 On the 7D the portable ROM dumper works fine in QEMU but not on the camera! Of course to run QEMU you need a ROM dump. That's a Catch 22.
check also my requests above. You'll be amazed that adtg_gui makes problems, too.